They call it The Right Cup. It was created in 2015 with the sole idea of helping people who do not really like the taste of water to drink more of it. Their ingenuity lie in the use of fruit scent infused in the cup, not the drink, to trigger the brain into thinking that you are drinking fruit juice when you are actually drinking water. They combined the sense of smell and sight to trick the brain to release the right neurochemicals associated with favorable tastes. The cup comes in various scents such as orange, peach, apple, cola, mixed berry, and grapes. Each of these scented cups is accompanied by a suitable color to accentuate the taste by complementing the visual perception of the scent. What motivated the creation of The Right Cup? The creator of this cup, being a diabetic, understands the life of flat taste most diabetics are condemned to live and that's why they developed The Right Cup to help improve the quality of lives of the diabetics. Their major concern is the lack of tasteful flavor in water, which makes its consumption an arduous task despite its health benefits. This is not to say that The Right Cup will change the taste of water. If that is the reason why you are going to buy this cup, then you are going to be disappointed. Water will still taste like, well, just water. Flat as it could be. The only enhancement you will be getting from this cup is the scent that you perceive through the nose and the appealing color that you will perceive through your sense of sight. It is small in size and can fit in your travel bag, so, you won't be bothered carrying it around when you travel. How does The Right Cup Work? When drinking water from the right cup, it releases flavor that you take in as you take in breath. The scent goes to the part of the brain that is responsible for perception of flavors. This is compounded by the visual feedback that is registered to the same center via visual perception due to the color of the cup. This gives your brain a vote of confidence that you are taking something flavorful when you are taking pure water. Flat as it could be described in terms of flavor. If you fall among the category of people who hold their breath as they gulp down water, you may be missing the party. You will need to go slow on this one. Just take your time and sip the water. Welcome to the party and have all the fun. Does the flavor last forever? Definitely not. Flavor is a degradable component and all the flavor components will be lost with time. The duration varies and can go up to six months if you use the cup right. Using the cup right means you only use it to take cold water. If you pour in hot water in the cup, all the flavor components will volatilize in a matter of days. Also, do not wash the cup with hot water or in a dishwasher. Just use cold water to clean it by hand. You will enjoy it for a longer time. 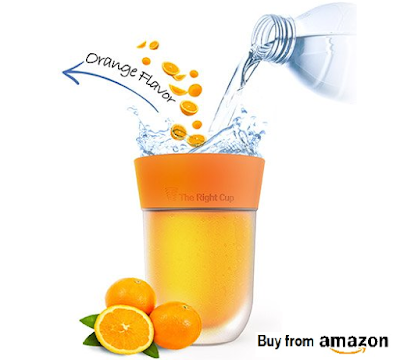 Get The Right Cup From Amazon Now.